Brian invited me to join him and some friends on a late Fall Longs Peak ascent via the Keyhole. I had never done that route, so I was glad for the chance. I met the group in the parking lot, and we started from the Ranger Station at 5am. We passed the Goblins Forest and a frozen alpine brook a couple of times as we switch backed up a hill before finally crossing the brook on some log bridges approximately 1 hour and 1.5 miles from TH. It was a cold day, but I was sweating like a boxer. I needed to lose some layers, but I didn’t want to stop the group to shift my clothing. The trail left the heavy forest shortly after the log bridge crossing and continued up to tree line near 11,000′ (approximately 2.5 miles from the TH). We stayed on the main trail through Mills Moraine heading toward Chasm Lake trail junction (11,550′) because Jim’s Grove trail was in poor shape. We reached the Chasm Lake junction (11,550′), 3 miles from TH, and then turned toward Granite Pass. Underneath Mt. Lady Washington, just before Granite Pass, we stopped for a water break. My wet clothes had me shivering like a vibrating bed. The group said, “wearing cotton, eh?”…nope, just wet. Now that I was cold and wet, I couldn’t stop wearing the clothes that got me wet in the first place. I was dreaming of a dry base layer; I was destined for misery, but I was going to finish off the Keyhole route. We then hiked past Granite Pass and then on to the Boulder Field. We continue through the Keyhole, then over The Ledges until we reached the Trough (~13,300′). The Trough was full of soft snow and was very slow going for the 600′ ascent. Once we scrambled over the top of the Trough, we started the icy Narrows, a wildly exposed ledge. Transitioning between ice/snow and rock was nearly fatal for me twice as my crampons were as much a hazard as a lifesaver. We reached the final pitch, called the Homestretch. It is a steep section of rock about 300′ tall that is often reported to be icy and treacherous. However, this time it was covered in somewhat soft, but still rather stable snow. We reached the summit quickly and took a long break. The weather was fine, but it was getting late in the day. I started wondering about how long before it got dark; I didn’t have a headlamp. After our water and food break, we hurried down the Keyhole route and reached the Boulder Field when it occurred to me that we had about 1 hour of light remaining. I decided to hurry ahead to get as far as I could with the remaining light. I got as far as the Chasm Lake trail junction before I was hiking in the shadows. The sky remained light for a while longer, but the icy trail was in the shadows and I couldn’t see the icy spots anymore. I slowed to a crawl after two separate head-over-heals sliding tumbles on the ice. I made it to the car by 7pm and drove home thinking about being better prepared. (3) Made several bad decisions along the way due to flaws & biases in my thinking. I had a free weekend and decided it was time to do Arrowhead Peak and take a look at the 4th class ridge to McHenry Peak. I had followed Brian up to Solitude Lake some years ago in the winter and figured it wouldn’t be too hard to find in the summer. Plus, I studied Roach’s RMNP guide for pertinent details. The approach and climb were fairly short, and the weather forecast was good; I didn’t expect to have any difficulty with time, so I took advantage of a late start. The hike in followed the normal approach to Black Lake but with an early exit from the trail below Arrowhead and Thatchtop at approx. 10,200 ft. After 1.5 hours, about 2 miles up the Black Lake trail, I crossed the creek and headed up toward Solitude Lake. 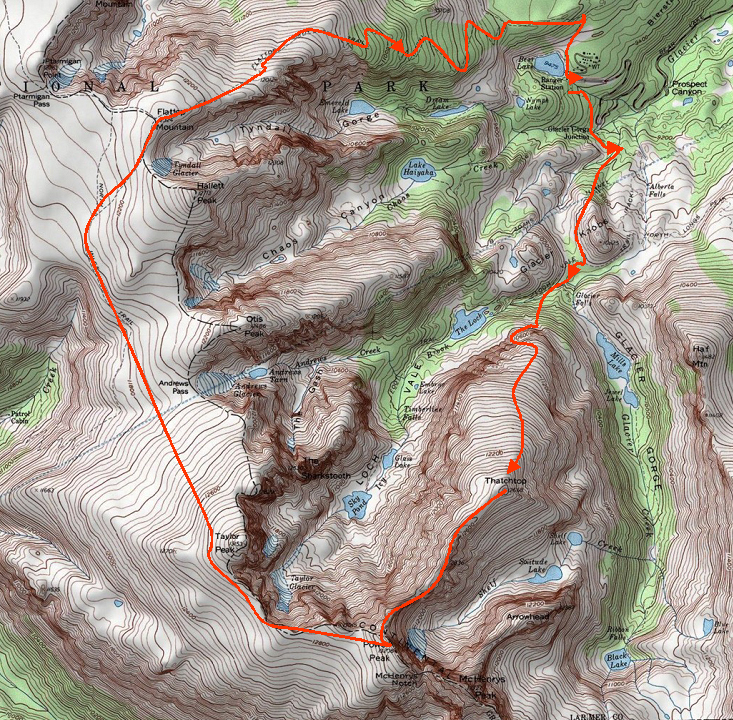 I never did find a clear trail, but managed to bushwhack using an approximation of the winter route I used with Brian. Since I didn’t get a predawn start, the steep ascent to Solitude Lake (11,400′) was a sweaty affair made terrible by swarms of hungry mosquitoes. I arrived a bit lighter of water and blood, approximately 2.5 hours into the day. From Solitude Lake, I hiked to the low point in the ridge between Arrowhead and McHenry. A specific climbing route did not look obvious, but a lone cairn seemed to show a way; so, I took it. The scrambling was fairly easy, and I soon found myself near the ridgeline. 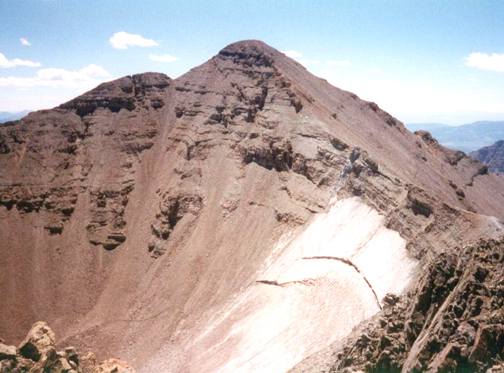 I continued scrambling along the ridgeline until I reached the distinctive Arrowhead summit. As I enjoyed a brief rest and water break, I examined the other side of the ridge for future climbing opportunities (many) and studied the ridgeline extending to McHenry for a possible extension to the days fun. The ridge to McHenry looked rather difficult, so I decided I would wait until I could bring better climbing shoes and get an earlier start. As I packed up my gear, I decided I would avoid the long detour of following the ridgeline. I didn’t have a topographical map with me, but I recalled thinking that the route could be straightened out a bit. Looking down the slope of Arrowhead, it all looked about the same; I picked a line that I thought was a few degrees to the right of my ascent route and started hiking. Almost immediately, I was lost. It is not easy to get lost on a small peak like Arrowhead, but I was lost just the same. I knew I could just backtrack to the summit area, and I suppose that means I wasn’t completely lost; but I sure didn’t know the way down. But the knowledge that I could always go back to the summit and the continuing good weather gave me the confidence to keep exploring. As I got lower, I got into a gully that looked familiar, and followed it lower. The gully became a chimney and the climbing became steeper until it felt technical; but I could see a big ledge 20 feet below that would allow me to exit the chimney and look around to see where I was; so I continued. The last move to reach the ledge was so difficult that didn’t want to repeat it. From the ledge, I could see that I was several hundred yards off course, directly above Solitude Lake. Strangely, I found a rap anchor, but no way down without a rope. The rap anchor gave me visions of a down climb of the sheer cliff beneath me, but I came to my senses and realized that I had to find a way back to the top. I hunted a bit for a better route, and found a chimney that looked better that what I had descended. I climbed it a short bit before realizing it was going to be even harder. I had to make a couple of unprotected, mid 5th class moves over loose blocks stuck in the chimney. Once I reached the flatter summit slope near the summit, I was still lost but not in any immediate danger of being stuck for the rest of my life. I decided, finally, to go back toward the ridge before descending the way I had come up. Finally, down to the main trail and 3 miles back to the car, and my surprisingly adventurous day was done. I had hiked approximately 10 miles, gained approx 3,400 feet in an 8-hour day filled with adventure and lessons learned. (2) Made several bad decisions along the way due to flaws & biases in my thinking. Optimism Bias: I was foolishly optimistic about being able to figure out a way down when I didn’t know enough about the terrain. Even when the decision started to go badly, I continued to feel that everything would turn out okay somehow. While reading Rossiter’s High Peaks guidebook, I found a passage that said, “…or you can descend via Thatchtop – it’s only 4th class…” I love traverses and so I decided I would use the traverse to the Continental Divide to bag Mt. Powell (13,208′) after summiting Thatchtop Mountain (12,668′) and then use it again to get home. Foolishly, I got a late start – only hiking by 8:15am. And I had to start from Bear Lake, since the close lot was already full, adding 15 minutes to the hike in. I reached the foot of Thatchtop Mountain around 10am, and hoped I had four hours before any bad weather might start. I started up the wooded east slope toward a gully I hoped would lead past the cliff band that separated me from the flatter summit slope above. The climbing was ugly and dirty as is typical for an unpopular hike, and for a slope enduring a recent avalanche; scrambling over fallen logs and avoiding sharp, broken branches added to the delays. (Note: on a subsequent trip in 2010, I discovered I was badly off-route.) Finally, I was able to look up the gully and confirm that only a few moderate moves would take me past the cliff. And by 11:30am, I was enjoying my barely earned but desperately needed water on the Thatchtop summit. I was also enjoying the great Glacier Gorge view, lined with my favorite RMNP peaks: Longs Peak, Pagoda Peak, Chiefs Head, and McHenry. From the summit, I noticed the western sky was blocked by McHenry Peak and the nearby Continental Divide (both close and above me). I was worried that I would not have any advance notice of approaching weather; but I figured I could turn around later. And I hoped my long-standing good weather luck would continue. Leaving the summit, I began the traverse with a full sense of thrill. With a shot of adrenaline, my mind became clearer and better focused on the work at hand, my body became more coordinated and better balanced, and my mind adopted a higher pain tolerance. It was the easiest climbing of the day. I kept thinking the hard part must be behind me, as it was “only 4th class.” But then I reached what must have been the normal crux. In dry conditions, it would have been a difficult climb over a knife edged ridge, but wet, it was impossible. I couldn’t even climb up the sloping rock to start the knife-edge due to the slick conditions. I hunted around and found a passage around to the north side: atop a 1,500 foot cliff hanging over Sky Pond, there was 1 foot wide ledge that would lead back to the ridge beyond the crux; but the start of the ledge was six feet away with only a 2 x 1 inch sized foot hold protruding from a sheer rock face with no hand holds between me at the ledge. During the 2-second move, I would have only the toe of my boot on the mossy hold with nothing else holding me up as I long-stepped through to the ledge six feet away. This was not the sort of fun I was hoping to have. In a state of denial, I went back to look for something else and to consider retreating over the difficult ground that I had passed to get here; but I once again decided I had no choice but to proceed. And I couldn’t wait as the rain and lightning had started again. I was able to hang on to a rock while I stuck my foot out to kick the horrible foothold to see if it was strong (it was) and to clean it off. And then I put my boot toe on the hold, weighted it, and stepped through. Fortunately, I was able to stay focused on the move and not be distracted by the potential fall or the lightning. After the relief of not dying wore off, it hit me that there was no way I could go back now. I simply had to find a way to the Continental Divide and then find another way home. Fortunately, the rest of the Thatchtop ridge was much easier, and I was even able to get some shelter below Mt. Powell when another fast-moving lightning storm blew in. With a brief bit of good weather, I was able to get the Mt. Powell summit (Note: on a later trip, I discovered that I missed the actual, and obvious, summit by 40 feet) and begin my long trek home. I figured that the only safe way back down was to traverse north beneath Mt. Taylor and then on to Flattop (~4 miles away) and then down the established trail to Bear Lake (another 4.4 miles). This way I would stay beneath the high points and avoid steep descents on snow, but I would still be exposed to lightning for a long time as I worked my way to the treeline near Bear Lake. The only reasonable alternative was Andrews Glacier between Mt Taylor and Mt Otis, but I just didn’t think it would be safe to attempt without an ice axe. Much rained on, badly dehydrated, and having hiking through a large herd of Elk, I arrived at Bear Lake and my car at 7:15pm. I hiked and climbed a 12.5-mile circuit in 11 hours, and felt lucky to be alive. But at least I got my 15 minutes back as I didn’t have to hike any farther than Bear Lake. The next two nights I slept badly with dreams of falling down a cliff toward Sky Pond. The route was not well known (not described in detail). Didn’t think about the ramifications of being late when driving into a popular destination: traffic, parking, etc. Assumed my turnaround time was 2pm instead of noon. Justify-Past-Actions Trap: I didn’t want to waste my efforts, so I resisted turning around when the initial rain fell and the conditions became much worse than I expected. Optimism Bias: Felt overconfident about unknown terrain; I consistently thought the climbing ahead of me would be easier than the terrain I had passed even though I had no facts available. This kept me from retreating when I could have done so. Gamblers Fallacy: Felt I could count on being lucky with the weather since I had been fortunate many times in a row. The weather was only periodically stormy; most of the time I was on the Continental Divide the sky was just sprinkling. Note: After my later trip to bag the Solitude Lake Cirque, and my discoveries of even more stupid mistakes I made on my Thatchtop Traverse, I am even more amazed at how my carelessness magnified the overall challenge and forced me into needless risk-taking. Wow, what a lesson! I had originally hoped to climb Castle & Conundrum on my July trip to do South Maroon Bell, but that barely successful effort was so exhausting that I had to go home without even an attempt. My plan was to return in August to do Castle and Conundrum via the Montezuma Basin after an early morning drive from Boulder. Everything went perfectly, and I arrived at the Castle Creek trailhead right at 7am, as planned. The rest of the day would not be so cooperative. The guidebook said to drive up the 4WD road for 2.3 miles to a fork and take the right fork to Montezuma Mine. At 7:30am, I was over 3 miles up the road with no sign of a fork. Some bad advice, too much faith in a guidebook, and a couple turnarounds left me 1.5 hours behind schedule before I started hiking from 11,000 feet at 9am. I found the Montezuma fork 200 yards beyond my first turnaround. I finished the 1,800′ and 2 miles to the 4WD parking lot at 10:30pm, when I met a couple that had just finished Conundrum. They said they used the snowfield for a “traverse and climb to the saddle between the summits.” Since I didn’t have an ice axe, I decided to continue with the Northeast Ridge route; but I made a mental note to consider a snowy descent. Later, when I could see the snowfield clearly, I saw tracks along the right side of the field skirting the two giant parallel crevasses that spanned the snowfield. The route finding went easily as cairns were plentiful and the route followed the path of least resistance. I reached the summit of Castle at 11:45am. And after a 30-minute break, I left for Conundrum, reaching the northern summit at 1pm. As I descended from Conundrum, I looked down into the snowfield and considered how much faster it would go than a return to Castle. I was tempted into taking a look. As I descended from the saddle, I found the slope steep and loose; I dreaded reclimbing it. When I reached the “snow” field, I discovered solid ice, and the “tracks” I had seen from the Northeast ridge of Castle were watermarks (grooves) from water running down the face of the snowfield. At that moment, I considered backing off, but thought I would at least see if I could figure out where the couple had gone. The only possibility for a “traverse” was via the flat bottom of the upper giant crevasse. As I neared the end of the crevasse, I could see it ended 40 feet short of the rocks. So that wouldn’t work, but I then found another option. Directly below me was a half-pipe, gouged by water running over the ice, which dropped into the lower crevasse that did reach the rocks. With too little thought, I decided to give it a try instead of going back up the steep, loose dirt to the saddle. Since the ice slope was moderate, I figured I could lower myself using rocks like axes to chop holds for my hands and by jamming my feet into the rocky, narrow bottom. Chopping holds in ice was hard work; and, at first, my concern was the time expenditure, but that soon changed. The lower I got, the steeper the slope became. If I slipped, I would be dashed on the rocks in the lower crevasse or I would bounce out of the crevasse and accelerate into the talus 200 feet further below. And to make matters worse, I could now see that the crevasse bottom was far below the bottom of the half-pipe. At this point, I finally realized that I had made a terrible mistake. But I was still alive and was determined to stay that way. I became even more deliberate in my hold chopping. When I reached the last 5 feet (after which the half-pipe became too steep), I stopped to consider my situation. I could see down into the crevasse; it was a 4-foot wide crack filled with large and small rocks with a 2-foot tall lip on the lower side. I could not lower myself out of the bottom because there was no way to hold on. If I let myself simply slide out, I would fall into the section of the crevasse that held the largest rocks. If I jumped out too far, I might miss the crevasse and continue at speed down the ice slope to the rocks. The only solution was to jump out of the half-pipe to section filled with smaller rocks, somehow land squarely, and then roll over to absorb some of the energy of my body falling 15 feet traveling 7 feet per second per second. The last problem I considered was the jump takeoff. I was concerned about my ability to control the jump, since I was jumping from inclined ice. I figured that if I slipped as I jumped, I might hit headfirst. I decided to take a few extra seconds and chop out the best holds of the day, and then use my rock hand axes as stabilizers to jump using arms and legs simultaneously (like some giant, crazy inverted crab) out of the half-pipe and down into the crevasse. At this point, my mind had gone into some kind of detached state. I felt no fear, but was rather mechanical about the situation. Some part of my mind knew what to do and set about to do it, while some other part of me was watching. When the holds were ready, I jumped without another moments thought. I didn’t think about how to jump or even run through it once in my mind to see myself doing it well. No power of positive thinking; no worrying; I just jumped. I seemed to hit instantly, but once I landed everything seemed to go into super slow motion. As I landed, I realized that I had made it, and I was pleased. In the next instant I was rolling over to the left, just as I had thought to finish the landing. This also pleased me, as I wasn’t thinking about what I was supposed to do nor was I in control of anything. As I started coming back into real time, I was consumed with a wave of adrenaline sickness. I was surprised by its presence since I had only ever felt it after extreme exertions, and I started to think about how it could have happened but lost the train of thought. I began to suspect I didn’t get hurt. All of this was in the first 2 seconds after landing. As my consciousness hit real-time, I started noticing more pain and blood. My hands and forearms were hurting and bleeding, probably from hitting the ground on the initial hard landing. As I lay on my side trying not to vomit, I got out my bandages out of my pack and taped my bleeding fingers. The nausea feeling subsided after about 5 minutes, and then I stood up to see how well my legs worked. I had made it. The hike out and the drive home went slowly due to a sprained ankle, and gave me a lot of time to thing about the mistakes I had made. I felt I had been given another chance to become a smarter climber. I promised to take full advantage of the opportunity. Didn’t have any knowledge of the snowfield prior to starting the hike. Confirming Evidence Trap: By heading down to the snowfield from the saddle, I had implicitly decided to descend that way. I kept finding reasons to continue and discounting reasons to go back. Optimism Bias: I felt optimistic about being able to overcome any unknown obstacles. As a result, I felt that moving ahead was less risky than retreating back over the known difficulties. Even as progress became harder, I felt the difficulties would end, and the difficulties I continued to pass reinforced the notion of a dangerous retreat. Denial Bias: I failed to consider what might happen if I slipped until I was fully committed to the half-pipe. If I had paused for a moment of consideration, I would have gone back to the saddle.